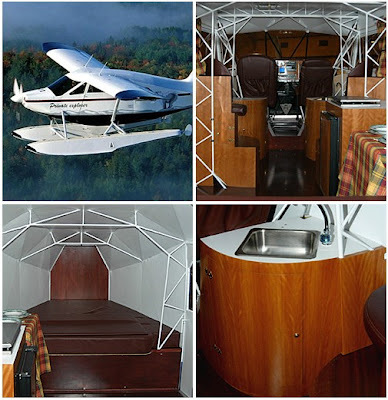 It’s basically a two-seater single-engine aircraft that doubles as a miniature cottage. While it doesn’t have anywhere near the luxuries of a bus-sized motorhome, it does manage to include a bed, a dining table, a fridge, a stove, a toilet, a shower, a water pump, and a heater making it considerably more comfortable than your standard tent. And since the Private Explorer comes with the option of adding floats, instead of just visiting the lake, you can use it as your actual runway. Understandably the Private Explorer will set you back about $102,000 ($130,000 CDN) which is pretty much what a well-equipped motorhome would run you. Though I’m not sure which one would have the higher gas bill. If you are looking for a more down to earth way of exploring Canada, check out RVRentalSaleFinderCanada.com for great deals on Canada RV Rental. This is great! My 4-year-old has been obsessed with flying moterhomes for awhile. I decided to do a search, and low and behold!